Having delivered one of our Top 10 Hip-Hop Albums of 2018 with this year's FM!, Vince Staples has now announced plans to take the effort on tour next year. 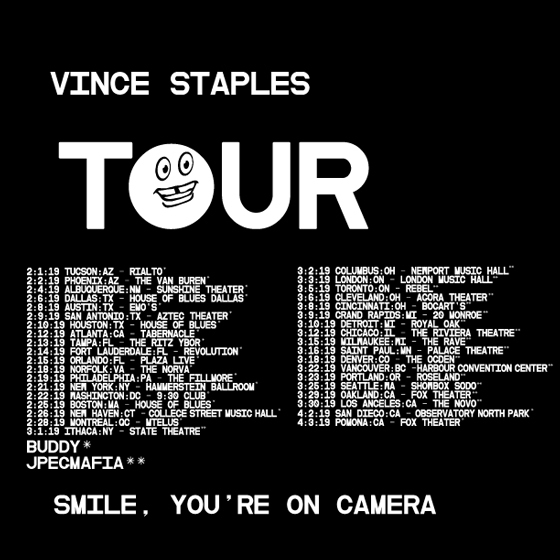 Alongside JPEGMAFIA and Buddy, Staples will kick off his "Smile, You're on Camera Tour" next February, playing 37 dates on the continent throughout February, March and April. Buddy will join Staples for shows in February before closing out the tour with a pair of dates in his native California, while JPEGMAFIA will appear at every date in March. Canadian stops will first bring Staples and Buddy to Montreal's MTELUS on February 28. From there, Staples and JPEGMAFIA will play the London Music Hall on March 3, Toronto's Rebel on March 5 and Vancouver's Harbour Convention Centre on March 22. Tickets and VIP packages for all dates go on sale December 14 and can be found here.